Equiteq is the global leader in providing strategic advisory and Mergers & Acquisition services to consulting and IT Services firms. We focus 100% on helping owners fulfil their exit goals. We do this by ahcieveing successful sales that deliver maximum value for firm owners and by proving strategic advice on what will best yield value growth and shareholder returns against their objectives. As an Equiteq Edge member, you will have free access to all our publications and insights. You can download a teaser of some of our publications now or access the full publication once you have registered for Equiteq Edge. Enjoy! Get the full version from Equiteq Edge here. 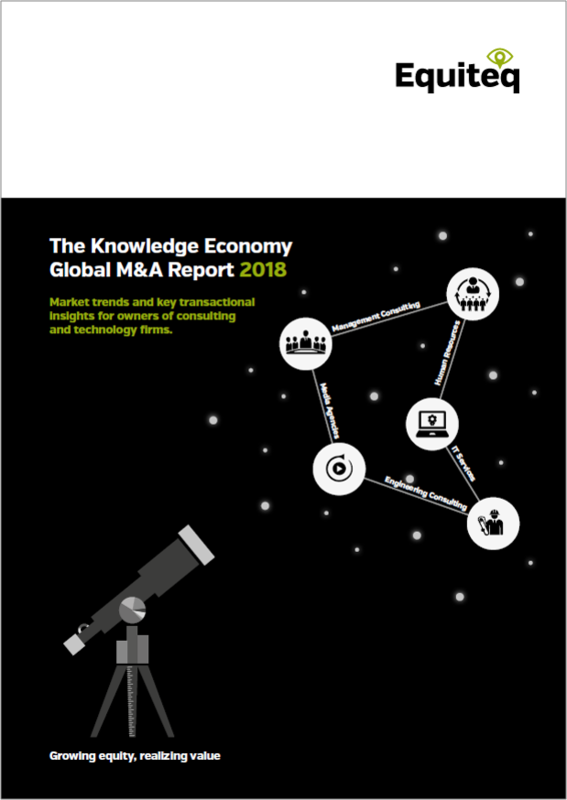 The Knowledge Economy M&A Report 2018 is the only publicly available information on the Global M&A market. It covers knowledge-led firms across all major industry segments including: management consulting, engineering consulting, HR consulting, IT services and media agencies. 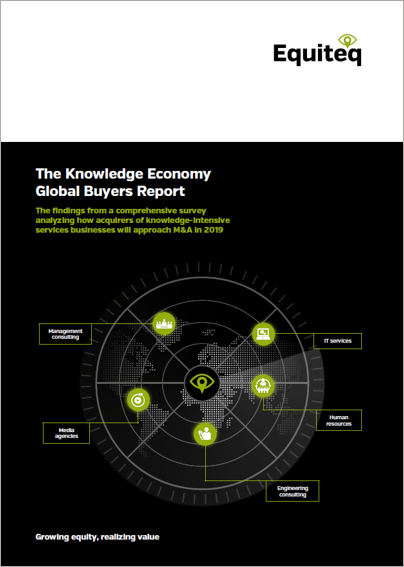 We reveal the findings from our fourth annual survey amongst global buyers of knowledge-intensive services businesses. This year we organized our survey to identify specific behaviours in each of the eight levers of our core assessment of firm quality, our Equity Growth Wheel. This will provide you with unique insight into how potential acquirers view specific elements of your business as you think about your future growth trajectory. 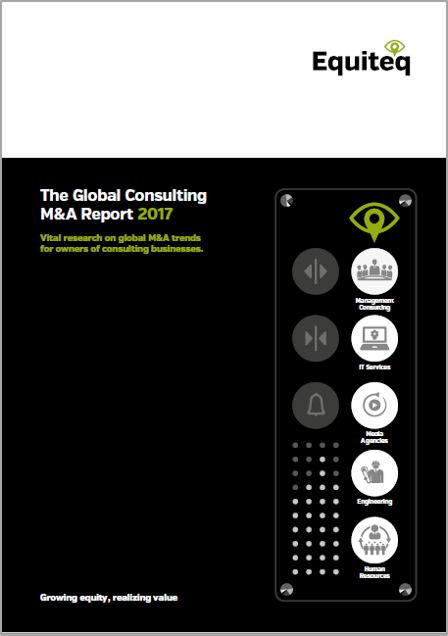 Our tenth Global Consulting M&A market trends report is packed with vital information for owners of knowledge-led firms who are considering selling their businesses. As well as deal sizes and structures, valuation multiples and regional insight, this year’s report includes equity market performance and buyer trends. For the third successive year, we reveal the findings of our annual survey of global buyers of knowledge-intensive services businesses. 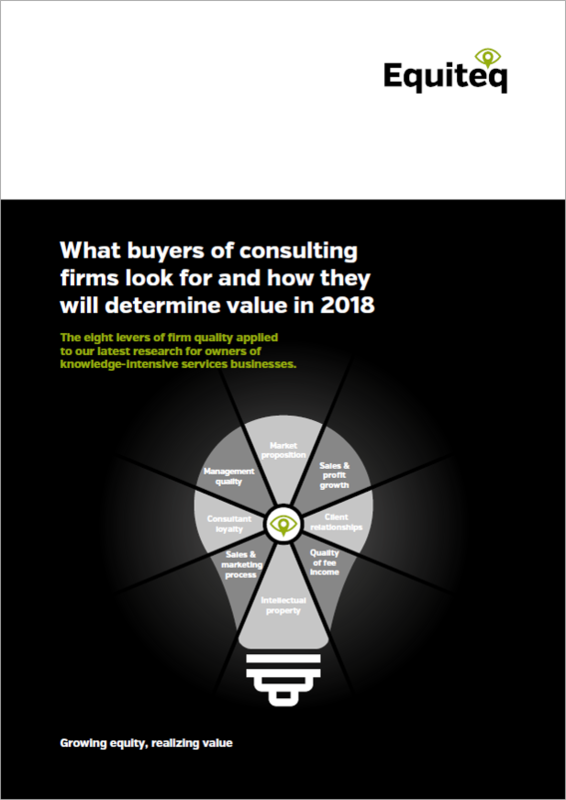 Our independent research of 150 buyers covers each of our five consulting segments of Management consulting, IT consulting, Media and Marketing, Engineering consulting and HR consulting. 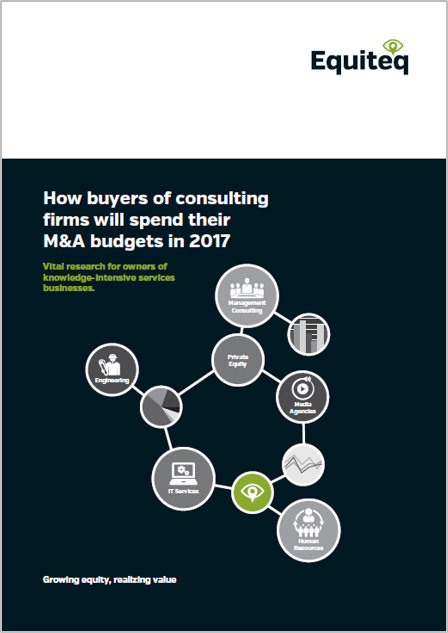 It’s also the first time we’ve analysed the perspective of both strategic buyers and private equity firms. 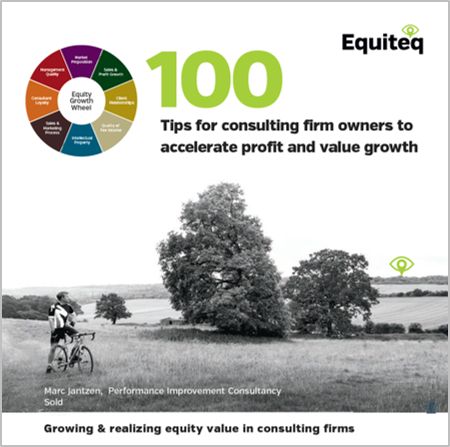 If you would like faster revenue and profit growth AND grow equity value at the same time, then this will be a handy guide for new ideas, or a reminder of what you know you should be doing! If you are planning on selling your firm, then why not talk to us about how you can best prepare it for sale, how to ensure you achieve maximum value and what you should be thinking about now in order to sell in the future. Please get in touch at info@equiteq.com.